Jharkhand is a state in eastern India, with Ranchi as its capital. Ranchi is known as the Waterfall City. It is in the eastern state of Jharkhand in India. 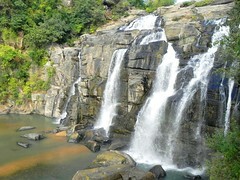 Ranchi and its surrounding areas are full of beautiful falls and streams. 144 feet high Dassam Falls on Kanchi river is at a distance of 40 kilometers from the Waterfall City. Hundru Falls, which falls from a height of 320 feet on Swarnarekha river, is another beautiful fall near to Ranchi. Jonha Falls and Hirni Falls are two other nearby falls to the Waterfall’s City in India. Panch Gagh Falls is another falls which is near to the water falls city, which branches out into five streams making a thunderous sound even at a distance. This falls in not very high thus making it a safe fall and is a tourist’s paradise. Panch Gagh Falls is at a distance of 55 kilometers from Ranchi, near to Khunti town(5 kilometers from Khunti ), on National highway 75 (Ranchi to Chaibasa Highway). Tagore Hill or Moradabad Hill, named after the Nobel laureate Rabindra Nath Tagore, is a major tourist center near to the city. Tagore hill has close connection with Rabindranath Tagore and the Nobel laureate liked this hill for its serene beauty and calmness. There is a Miniature version of the famous Puri Jagannath temple at the city, which is a tourist center. Sun temple is another major temple in the city. It is believed that taking a dip in the holy pond here absolves one of his or her sins. Ranchi is well connected by roads, railways and by air. National highway 23 and 33 passes through the city. There are regular bus services from the water falls city to other parts of neighboring states. Jamshadpur, Varanasi, Patna, Kolkotta, Rourkela, Hajipur, etc, are some of the cites which are connected either by government or private buses. ‘RNS’ is railway station code for the main station in the city. Hatia railway station is another main railway station in the city. There are regular trains to Kolkotta, Delhi, Mumbai, Bangalore, Chennai, Vishakapatnam, Hyderabad, Nagpur, Amristsar, Juri, Surat, Jammu, etc. Birsa Munda airport at Ranchi is well connected to other parts of India by flight services.